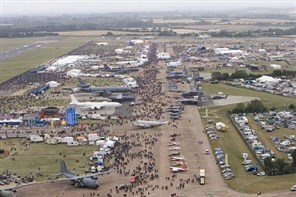 Held annually each July at RAF Fairford, Gloucestershire. The Royal International Air Tattoo, the world's largest military airshow, has gained the well-earned reputation as one of the UK's top outdoor family events. Few events can rival the intensity, drama and spectacle on offer at the world's greatest airshow. The Air Tattoo, one of the UK's premier outdoor events, returns next summer with an extravaganza of entertainment for all the family. Alongside the thrilling flying action, visitors will be treated to non-stop entertainment on the ground - so whether a wide-eyed first timer or a seasoned airshow veteran, the experience is breathtaking. During the thrilling 7.5 hour flying display visitors will get to see fast jets, giant transporters, historic aircraft, and much, much more. There will be a chance to meet the crews, get close to the aircraft and enjoy a feast of first class entertainment including the Techno Zone, an interactive showcase designed especially for youngsters, the Vintage Village, Autodrome and the Adrenalin Zone. With over 300+ aircraft participating each year, upwards of 170,000 visitors and support from the Royal Air Force and some of the world's leading aerospace companies, the Royal International Air Tattoo has been acknowledged as not only the world's largest military airshow but also one of the UK's premier outdoor events for the whole family! With FREE entry for accompanied under-16s, the Air Tattoo offers great value for money day out. ** Child U 16 free entry with a paying adult ticket, must tick child ticket and pay for seat on coach.